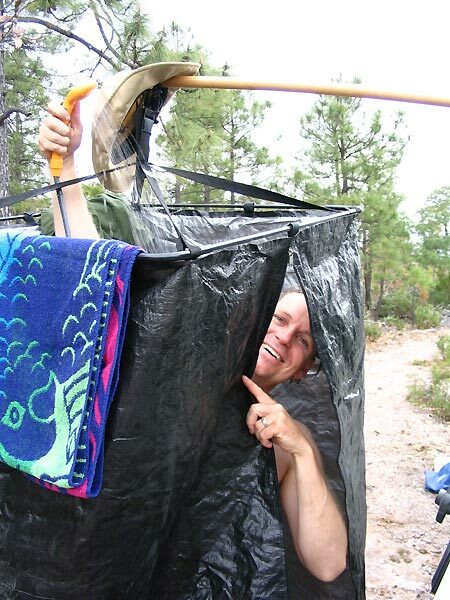 For our Baja Expedition 2000, and many other trips, we have used a basic solar shower (heavy duty black/clear vinyl bag) with great success. I have since purchased a nifty little portable shower kit that will plug directly into a 12V power outlet, or run on D-cell batteries. The shower operates by dropping the submersible pump into a water source and depressing the power button on the control box to make it run. Additionally, there is a water flow control on the shower head itself to turn the flow down, if for example, you are lathering up some bio-degradeable soap and want to conserve your water. This shower does not heat water. 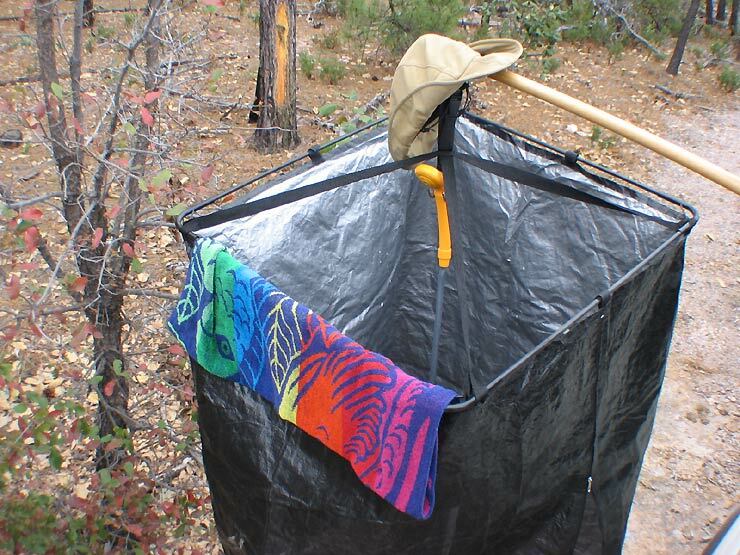 So if you want a hot shower, this can be used in conjunction with a solar water bag, or I also like to use a small pot or bucket and just heat some water on the stove or a camp fire. Once you have some really hot water, it can be mixed with cold water to achieve a good amount of toasty water for a nice shower. 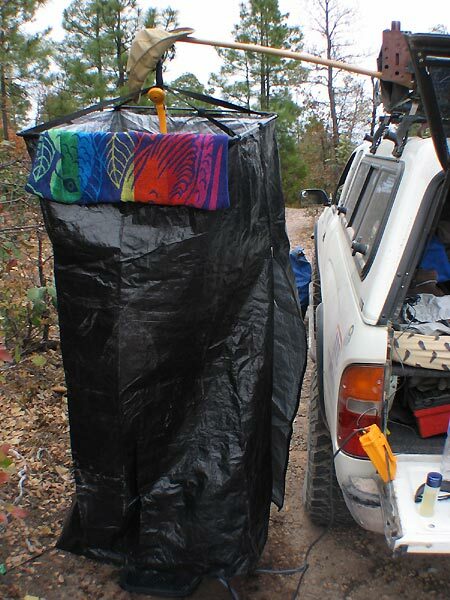 For trips when a little privacy is desired or required, I purchased a hanging shower blind made by Stansport and a wooden flag pole to use as a hanger. The pole wedges perfectly between the Hi-Lift jack and the roof rack. It has an adjustable collar on it that holds the loop for the shower blind in place. If it is breezy, the bottom of the shower blind can be staked to the ground. For a floor, I use one of the all-weather floor mats from the truck. It keeps the feet nice and clean and is dry by the time we need to hit the trail again. I see a lot of these little shower kits available these days but they never seem to have the option for a direct 12V power supply. They all require batteries. 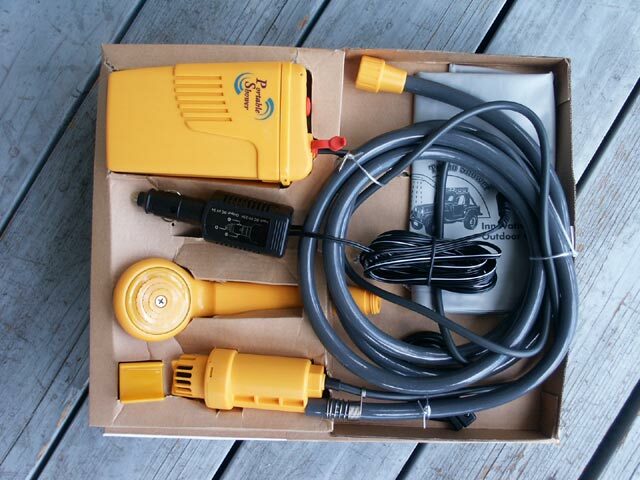 I was really happy to find this one with a 12V power cord since I have a dual battery system and don't want the waste and extra weight of D-cell batteries. I have a 12V power port with dual outlets installed inside the camper. 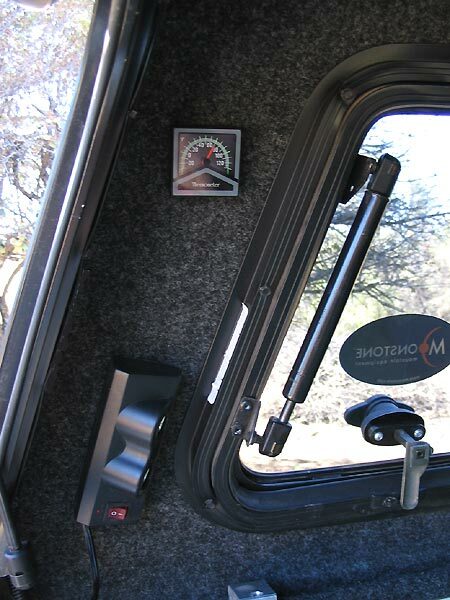 The power strip is on a stretch cord, and attached to the wall of the camper with hook tape so it is easily removed from the wall for extra flexibility in hooking up 12V accessories. How to win friends and influence people :-) Just break out your shower kit! 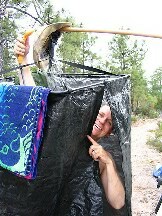 Smiling is made easy when you can have a hot shower at camp.